Good Afternoon! Our team is back in action, @The Cathedral of Football, against Eastern Conference rival New England Revolution (8:30pm, FSC). This is a massive, massive fixture for the Red Bulls, who will be off on a 4 game road trip after this one. Let's analyze how both teams come into this one. The Revs are really hurting. They're currently sitting in 6th place (Eastern Conference) and have lost their last three League games. They will be desperate for all three points on offer today. Their confidence will be high, as Red Bulls killer Shalrie Joseph declined the call to play in the Gold Cup (with Grenada) and will be on the pitch today. 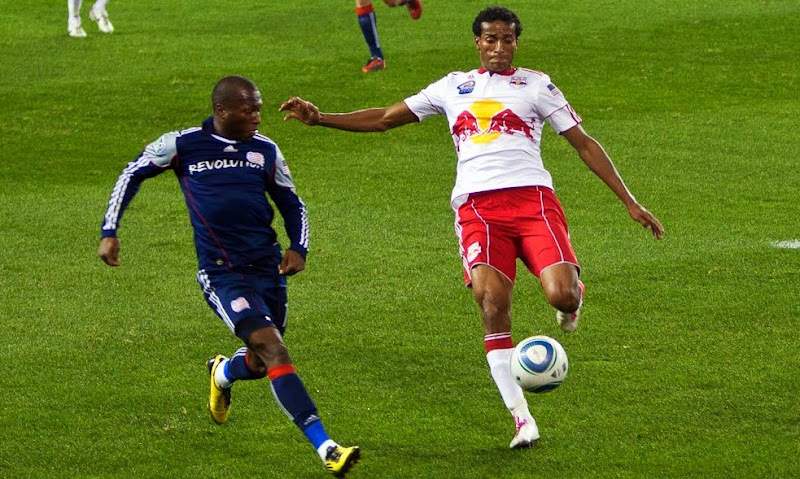 The Red Bulls come into this one sporting a 0-1-5 record. RBNY hasn't won a game since April 30th and gave up a brutal tying goal to Columbus in the dying seconds of last Saturday's game. Several key players are still out, due to Gold Cup duty, and DJ Jan Gunnar Solli very questionable for this one, due to a hamstring strain. The Red Bulls need a win tonight and Joel Lindpere didn't mince words on how much (a win is needed). With all that in mind, let's get to some predictions. After last Saturday's game, as I drove viper home to his palatial estate in Paramus, I said I would not be making a prediction for this week's game against New England, and I'm going to keep my word. But let me just say this: the Red Bulls absolutely MUST get three points against the Revs. They've now gone more than a month without a win and have found all kinds of creative ways to let supporters down over that period: set piece screw-ups, penalties conceded, free kicks, you name it. The one thing we have not yet seen is an own goal. So I am going to predict an own goal surrendered by the Red Bulls. Well either that or a red card. If it's a RBNY win I will consider it the minimum return, though of course I reserve the right to smile and gloat if by some miracle we run roughshod over New England. If it's a loss or another catastrophic draw you won't want to be near me after the game. I can't predict anything but a draw until we prove we are capable of anything better. A 1-1 draw, on a goal from Le Capitan Henry. Following the match, physical blows are exchanged between Luke Rodgers and whichever teammate is responsible for giving up the equalizer. We played one of our local rivals, DC United, and thrashed them 4-0. But then we played Union and that loss was excruciating. Tonight we face New England Revolution, and on the back of a six-game winless run I really fear tonight could be the night we truly slip into mediocrity. Anything less than three points and we're really floundering. Goodbye Supporters Shield, hello wild card play-off qualification at best. Too early to make such pessimistic predictions? You don't fail to win seven games and then turn into champions, not even in Major League Soccer. How about a bit of optimism? I mean, look how close we were against Columbus Crew. Seconds away from a win which could have reignited our season. It was a devastating blow, but it just shows that we are capable of reversing this slump. Hopefully Backe and his men will take the positives and address the negatives and take a much-needed victory tonight. How does a 2-1 Red Bulls victory sound, with goals for Henry and Lindpere? Sounds just fine to me. I hate to say it but I think we are into a typical Red Bull/Metro deal where it will become, after every match"we know what we have to do its just a question of going out and doing it. "you know what I meanI think a losing mentality has sunken inI hope to god I am wrong but these last six weeks have a familirar ring to them. I'm predicting a 2-1 Red Bulls loss. Alrighty then! Look for our Award Winning coverage of this one in the coming days. Hope to see you all tonight. Viper out!